CrossFit is a strength and conditioning program defined as "constantly varied functional movements executed at high intensity across broad time and modal domains". We offer orignally created programs depending on your fitness level and goal so that anybody can join our class. We set a mood for classes and provide a good environment where you can enjoy yourself with members. We support to create a community of members through classes and to make CrossFit an important part of your life. We start from January 5th. During the Trial lesson,you will have explanations about CrossFit and its objectives. You will learn the foundational movements and apply them into a CrossFit workout.CrossFit is adaptable for everyone,No matter your level of fitness and your age.We accept reservations for classes by the following link. All class fee are ¥2,160/time, which should be paid at the BOX each time. Please bring clothing and shoes (towel,drink)appropriate for working out. if you are unable to attend the class you booked,notifying us by Email or Phone at least 24hrs before. ※ Minimum 3 month membership. As a competitive swimmer, Takeshi participated in the Olympics four times and earned four medals in total at three of them. After retirement in 2016, he found CrossFit and started CrossFit Minatomirai with the view to spread CrossFit's "strength and conditioning program designed to improve all sports performance as well as the daily life and excitement of group training" in mind. Message from Takeshi: I hope to contribute improvement of your athletic ability and quality of life, and use CrossFit Minatomirai as your communitiy activities, where I would like to share various sports and other experiences. Taishi started swimming at the age of two, and continued until his twenty-four years as a Japanese national team member. After retirement, he was living a life away from any sports. But when he found CrossFit, he realized that the fun of training with members and the sense of accomplishment lead to higher performance in workout. Also, since CrossFit includes a variety of movements beneficial for all sports, he hope to spread CrossFit to people of all ages. Message from Taishi; Let's train joyfully together at CrossFit Minatomirai! Tomohiro found CrossFit when he was playing American Football in 2013. After retirement in 2014, he started CrossFit as a competitior. Since then, he has participated in numerous competitions in Japan and Europe and learned CrossFit as a coach as well. Message from Tomohiro: I will help you with that every one hour spending at CrossFit Minatomirai makes your life better! Shinji graduated from a local sports college and used to be a weight lifting competitor there. After retirement, he has worked as a trainer in Tokyo covering a wide range of subjects such as weight lifting, S&C, CrossFit and body building. Also, he writes training and nutrition column and gives a lecture on nutrition. ※ 1 session time is 1 hour. 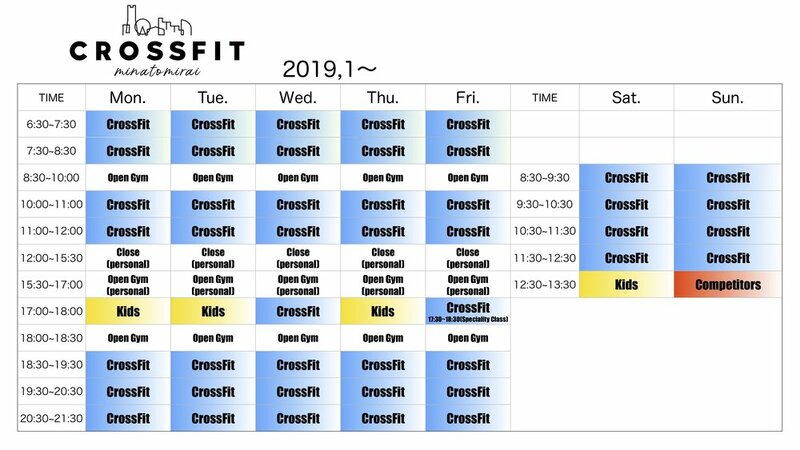 ※ Weekend CrossFit schedules also apply for holidays: 9:30-10:30, 10:40-11:40, 11:50-12:50. No Kids nor Trial sessions on holidays. CrossFit Minatomirai © 2018 All Rights Reserved.